My loving, caring, passionate, strong-willed Big Sister E excels at many things, but (and this is difficult for her naturally athletic mother to admit) she's just not all that coordinated. She tries hard at whatever sport we might be casually playing, but the skills just don't come all that easy to her. But as some activities aren't difficult to explain, there are others that are harder and more aggravating to try to learn... with baseball and softball right up there near the top of the list. Even starting with the basics of t-ball, we haven't worked on Big Sister E's hand-eye coordination nearly enough for her to be able to hit the ball with a good swing instead of just happening to knock it off of the stand. Since something she did inherit from me is my lack of patience and high frustration level, it seemed pretty clear that sports requiring a ball and a bat just weren't ones that would be played all too much around here. And then we were introduced to Monkey Business Sports and their E-Z Bat and suddenly baseball didn't seem like such a huge feat anymore. 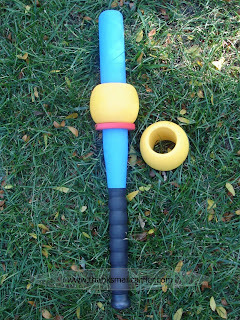 A simple but unique invention, the E-Z Bat is made up of an extremely light, foam-covered bat with a movable stopper and two foam balls with holes in the middle. After sliding one (or both) of the balls onto the bat, your child winds up and swings the same way that they would if they were standing on a baseball diamond. The force of the swing causes the donut-shaped ball to fly off - and the distance it will go depends on how fast or hard the bat is swung. Essentially, your child can get great practice at being a home run slugger without having to deal with the coordination or timing hassles that usually come along with it. And being able to succeed every single time? Well, that just makes for a plain old great time out in the yard. 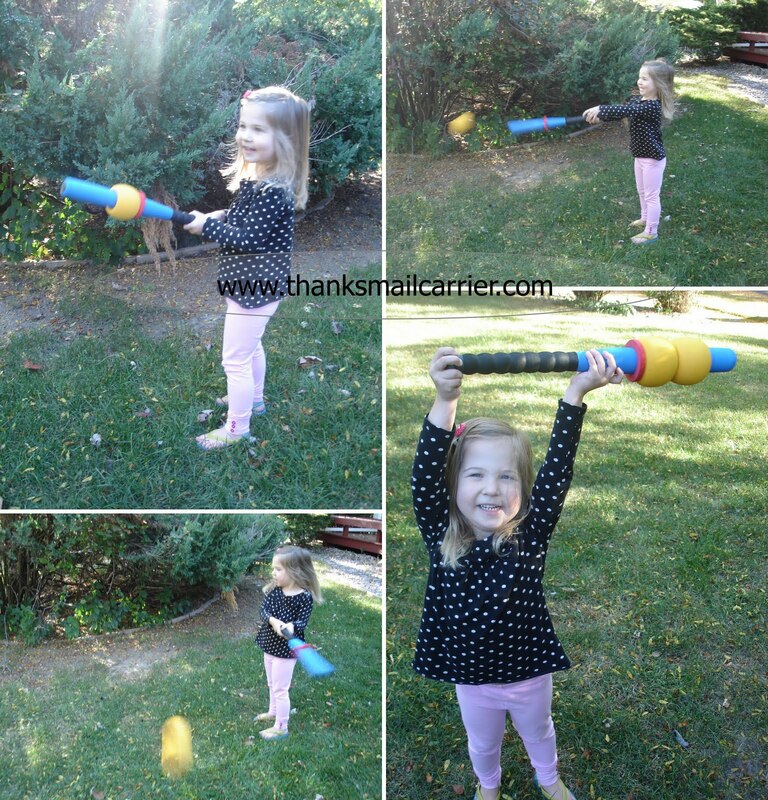 After about three tries with the E-Z Bat, Big Sister E turned to me and said, "This is fun! I like baseball!" while I nodded and laughed. Seeing her so proud of herself and her ability to succeed every time made playing with this a great experience for both of us. 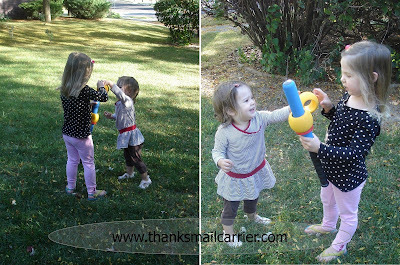 In fact, even Little Sister B got in on the action by running out to get the balls and bringing them back for her sister to take another swing. Yay for teamwork! Plus, as we continued to play I could see Big Sister E's technique of holding and swinging the bat improving. With the E-Z Bat itself reinforcing good habits (i.e. the better the swing, the further the ball sails) I like the way that this bat does all the instruction on its own. 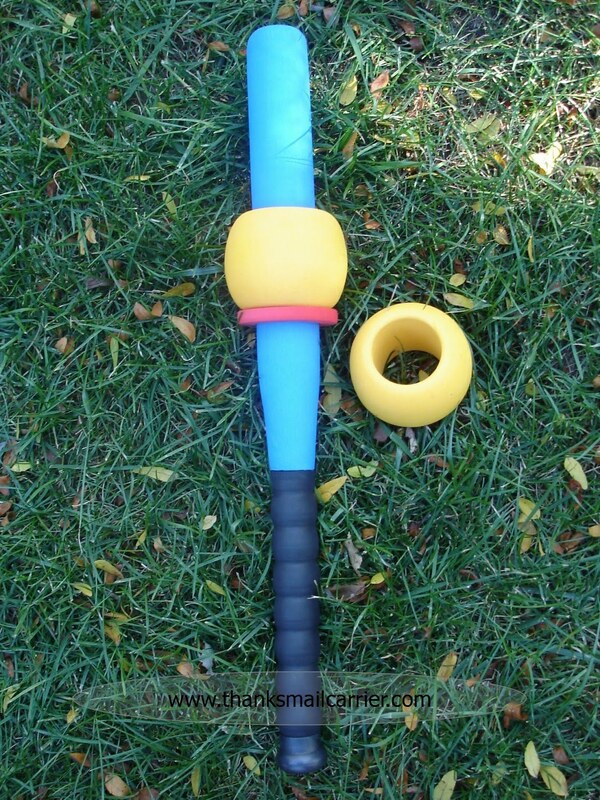 And once your child perfects their swing, simply remove the stopper from the E-Z Bat and pitch the balls just like traditional baseball - this bat really grows with your child! A major innovator in active play toys, Monkey Business Sports has a full collection of creative and unique products for indoors, outdoors or the tabletop that kids and adults are sure to enjoy. For items that go back to simple play -no technology or electricity required- you'll find page after page of great items for all ages, with many under $10! 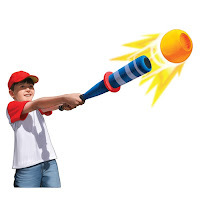 One lucky person will win their choice of E-Z Bat, FoamStrike SwitchBlade or FoamStrike PocketShot from Monkey Business Sports! To enter to win: Visit Monkey Business Sports and tell me which of their great products is your favorite. 3 Extra Entries if you blog about this giveaway linking back to Thanks, Mail Carrier and Monkey Business Sports. Please leave an address where it can be found. A big thank you to Monkey Business Sports for providing an E-Z Bat for me to review as well as the choice of select products for one lucky giveaway winner. The opinions shared are my own and honest if you really need to see more, click here to see how I roll. I subscribe via GFC, thanks! I subscribe via GFC #2, thanks! I really like the FoamStrike Compound Bow X2. Like Monkey Business on FB. The bungee jumper looks too fun!! I like the Stomp Walkers! MANDATORY ENTRY: I really like the "Top Spin Table Tennis." I have always been a Ping Pong fan so I would really love to own this product. I love the bat you tried out! Looks like a lot of fun! ...the last one should have been #2 not #1 again...my bad! The E-Z bat looks like a lot of fun:). Great idea! I really like the idea of the ez bat. The Bungee jumper looks like soooo much fun!